This is a pretty easy subject for me. I’ve never been impressed with money and with people that think that they’re better than anyone else because they’ve been blessed with good fortune. They always think that they made it on their own, when nothing is farther from the truth. Perhaps in our little capitalistic world some people can actually amass incredible fortunes for doing very little, but that hardly justifies their selfish actions in doing so, as they amass fortunes beyond their needs. Survival of the fittest has been replaced by survival of the fattest. When I think of wealth for the sake of itself, I can’t help of thinking of the Little Prince where one of the people he met in his travels owned stars. When the little prince asked him, What good it was for him to own the stars?, he had no reply. He just kept claiming that he owned the stars, even though it was of no use to him or to the stars. As with wealth for wealths sake, it makes no sense to amass a fortune at the expense of your neighbors and friends, without thinking of the consequences of your actions. Did you really make it on your own? Did you build the roads that got you to your business? Did you provide police and fire protection? Did you build the sewer and water systems that allowed you to operate your business? Did you provide the education for your work force. To all of these questions the answer is a resounding NO. To not recognize the contribution of the community is a fatal character flaw. Another word that comes to mind when I think of excessive greed is the Indian word Keshagesh. Keshagesh means greedy guts. The analogy they use is that if you leave a puppy around an unlimited supply of food he will eat himself to death. And that’s what the ultra wealthy do. They amass wealth at the cost of their soul. So, I’ve come to the conclusion that if you work harder than a school teacher, you can have more. Our system based on the more and bigger and better things you have, the more successful you are, is a practice not based in reality. Most all of us; Teachers, Firemen, Policemen, Carpenters, Electricians, Farmers, Ranchers, Doctors, Nurses, Artist, Mechanics, Merchants, Inventors, Athletes, yes, and even attorneys, in most cases, do what they do, not for the money, but for the love of their occupation, however humble. We are all in this game together, and I’m sick and tired of this MONOPOLY game, played by the ultra wealthy at our expense. Most of us do what we do for one of four reasons: Either we have an aptitude for a profession or we enjoy doing a certain job or we think we can be a productive member of society by doing what we do or we were inspired at some point in ours lives to do what we do. Most of us really don’t want too much, a home, a car, healthcare and education, and clean air and water and earth. This notion that somehow happiness is based on things has totally subverted, distorted and derailed our progress on earth, and left us morally bankrupt. We all contribute in our progress together. I love the people that think they’re special and above average and that actually think they deserve so much more than the average contributing member of society. We’ve been duped into believing that we should have to pay private insurance companies for our healthcare, have lots of money for education or be debt ridden upon graduation, and that justice depends on your wallet and that the media tells the truth. I thought our constitution started off with, WE THE PEOPLE and that we are guaranteed the right to Life, Liberty, and the Pursuit of happiness. With our current economic system, these rights are unattainable for the vast majority of people in the United States, let alone the rest of the world. I think that the same people that had control ten thousand years ago are the same people that have control now. They are the land barons, the oil barons, the food and water barons, the bankers, the BULLIES of our planet. They have no conscience for their actions or consequence either, only profit and power are their motives. They operate under the guise of knowing what’s best for all of us. But they don’t, their greedy bastards that have only their self interest in mind. They have set up a monetary system that insures their continued success at the expense of all of us. Monsanto, Bayer, Nestle, Dupont, Lockeed Martin, Exxon, and of course the Bankers, have control and manipulate the truth to serve their best interest. What you hear is what you believe, as evidenced by North Korea, and as fewer news outlets are independent, this situation is becoming more and more prevalent in the free world. Our corporate media structure is totally to blame for our situation. If they hadn’t devolved into a corporate money making pig, they would have been doing their job and investigating what the government says and not parroting what the government says. If they had been doing their primary job of investigative reporting there wouldn’t of been the need for heroes like Bradley Manning and Edward Snowden. The elimination of the Sherman anti-trust law, and the Fairness Doctrine, and allowing foreign ownership of our media has left the door wide open for the God Almighty Dollar. I’ve said it before but the media, healthcare, justice and our education should be exempt from the capitalistic system. Money should never be the driving force when it comes to our basic needs. We are all a very small part of this planet, and although some might think that they have a right to destroy our planet, their wrong–they don’t !!! We can only survive as a species if we value and recognize the intrinsic worth of the working class hero’s. We all have value but some think they have more value and deserve all that they have. Having an economy based on debt and the financial industrial complex has turned our country upside down. We used to do our own manufacturing and we were proud of the “Made In America” moniker. We had industry that we, the working people gave birth to with our labor, sweat and time, and then as a reward for our dedicated service, the corporations moved the labor force to other countries, to sweat shops overseas, because sweat shops in the U.S. are outlawed, so they could maximize their quarterly profits. Nothing else matters to today’s corporations but profit. At one time when corporations first came into existence they had to show that they had some positive contribution to society or their corporate charter would not be renewed. The financial and banking complex are parasitic and serve no useful purpose in society. When your toilet overflows you’re not going to call Goldman-Sachs. And now back to the original question. Do you work harder than a school teacher? Most teachers work sixty to eighty hours a week, and are responsible for educating our children and preparing them emotionally and academically for their world. What do you do?, and is your job more valuable to society than that of a school teacher? I don’t think so, so get off your high horse and join the rest of humanity in their search for humanity. To make a living for the love of money is pathetic. These Oligarchs should start counting the days when their empire is going to collapse. One way or another this financial farce is going to fall apart, this ponzi scheme will end. Then We The People will be in charge, and no one person or corporation will own everything. 2010 was another good year to make lots of money—if you were a CEO. 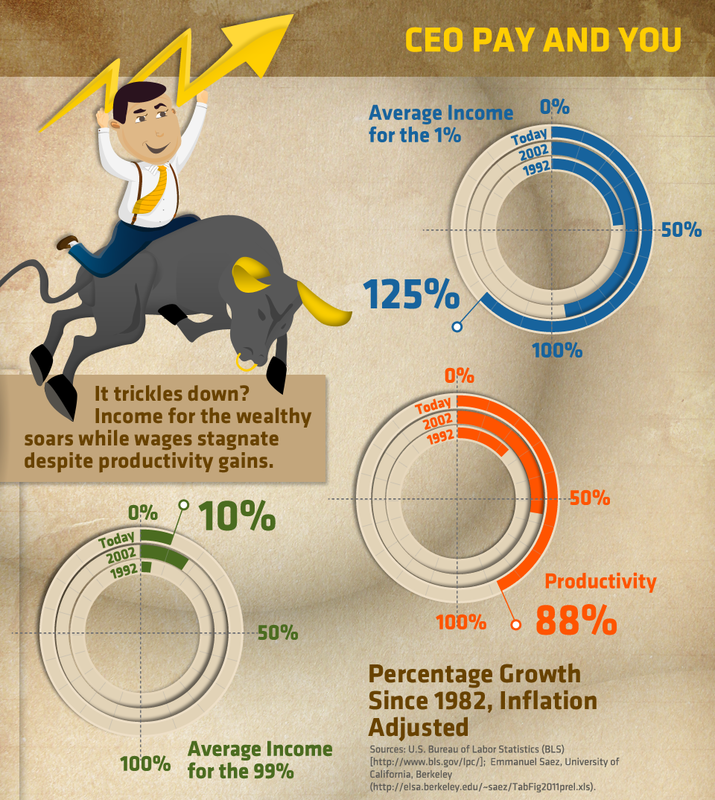 CEOs of the largest companies received, on average, $11.4 million in total compensation last year, according to the AFL-CIO analysis of 299 companies in the S&P 500 Index. Overall, CEOs of the 299 companies in the AFL-CIO Executive PayWatch database received a combined total of $3.4 billion in pay in 2010, enough to support 102,325 jobs paying the median wages for all workers. America sells AIR and PAPER. Air is our Internet, our phones, our computers, all of our communication devices. Paper is our insurance industry, wall street, banking, investment groups, and our monetary system. Our society is upside down. The people that get rewarded in our society are the people that you really don’t need. You need teachers, firemen, policemen, carpenters, truck drivers, cooks and waitresses, plumbers, mechanics, engineers. You don’t need insurance, or banks or investment firms or debt. The people that do the least as a productive member of the community get rewarded the most. We need a system where the wealth is more evenly distributed. I like butchers and bakers and candlestick makers. I’m not particularly fond of the wealthy. I find the wealthy arrogant, self serving, pedantic and generally not really deserving of all that they have. I would rather be healthy in spirit than rich in material acquisitions. I would rather find pride in what I do than pride in how much money I can make. I would rather spend time with my family than time at the office. We need a system now where the people that do manual labor and basically keep our society afloat can have healthcare and a place to live and educate and feed their children. We share the taxes but what about the WEALTH! In 2007 the top 5% enjoy 72% of the wealth. Source: Executive Excess 2008, the 15th Annual CEO Compensation Survey from the Institute for Policy Studies and United for a Fair Economy. Source: Executive Excess 2006, the 13th Annual CEO Compensation Survey from the Institute for Policy Studies and United for a Fair Economy.